29 years old, forbidden to leave his country, playwright Nassim Soleimanpour distills the experience of an entire generation in a wild, utterly original play. 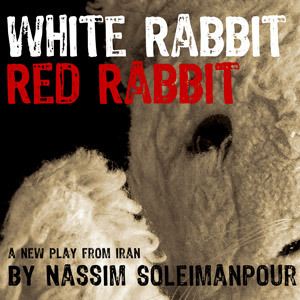 White Rabbit, Red Rabbit is a work about contemporary Iran and of Nassim’s generation. A generation born amidst the hardship of the Iran-Iraq war. A generation of computer-literate, well-informed young people who have never known an Iran other than the Islamic Republic. A different actor reads the script cold for the first time at each performance. Will you participate? Will you be manipulated? 20th August – Wendy Seager: Wendy is currently appearing in David Leddy’s much acclaimed Long Live the Little Knife at the Traverse Theatre. Previous theatre credits include; The Rise and Fall of Little Voice (Visible Fictions), Six Black Candles (Royal Lyceum) and Sweet Fanny Adams in Eden (Stellar Quines). Her Radio work includes numerous works for Radio 4 including The Life Class for which she was awarded SONY Best Actress. 21st August – Maureen Beattie; Maureen is currently appearing in Stellar Quines’ The List at Summerhall which won a Fringe First in 2012. Previous theatre has included working with the RSC as part of their much acclaimed Histories company and with the National Theatre of Scotland for The Enquirer and 27. Her television work has included roles in Casualty, Lewis, Midsummer Murders, Taggart, The Bill and Doctors. 22nd August – Blythe Duff; Blythe is currently appearing in Fringe First winning Ciara at the Traverse Theatre. Previous theatre includes: Marco Pantani: The Pirate (A Play, A Pie and A Pint, Oran Mor); Iron (Firebrand Theatre Company); Good With People (Datum Point/Traverse Theatre/Paines Plough); Beautiful Burnout (New York/.Sydney/Perth/Wellington). National Theatre of Scotland and Frantic Assembly; Be Near Me (NTS and Donmar Warehouse). Blythe played Jackie Reid in Taggart (ITV) for 21 years, is patron for SYT, an Ambassador for the Princes Trust and has an Honorary Doctorate from Caledonian University for her outstanding contribution to the performing arts. 24th August – Billy Mack; Billy is currently appearing in Preen Back Yer Lugs! at Pleasance Dome. TV credits include Monarch of the Glen, High Road, Taggart, Battlefield Britain, Still Game, Hope Springs, Garrows Law and most recently Bob Servant Independent. He has been fortunate enough to win The Stage Award for Best Actor at the Edinburgh Fringe twice, the first actor ever to have achieved this, his first for The Sound of my Voice, the second for The Overcoat. 21st August – Maureen Beattie; Maureen is currently appearing in Stellar Quines’ The List at Summerhall which won a Fringe First in 2012. 22nd August – Blythe Duff; Blythe is currently appearing in Fringe First winning Ciara at the Traverse Theatre. 23rd August – Eric Lampaert; Eric is currently appearing in Two Tickets to the Gum Show at Laughing Horse@ The Counting House. 24th August – Billy Mack; Billy is currently appearing in Preen Back Yer Lugs! at Pleasance Dome. "A thoughtful, playful response to oppression." "The play is sharp...and ab-crunchingly funny"